Today’s ink is Pen Saijiki Kazahana. I have had so many people ask me for recommendations for mint green ink, and this one is a great mint green color. I purchased my sample of ink from Vanness Pens. Kazahana is a very light mint green. In large swabs the ink looks brighter than it does in writing. Since the ink is so light the color of the ink changes with the color of the paper. It looks warmer on cream paper and cooler on white paper. Other properties: no shading, no sheen, and no shimmer. I think the color is just too light to see any shading. On Staples 24 lb copy paper there was just a little bit of feathering, and a bit of bleeding in the flex nib. Ink swabs for comparison, left to right (top to bottom for mobile RSS): Diamine Soft Mint. Pen Saijiki Kazahana, and Diamine Spring Green. Soft Mint is actually teal, but it’s the closest ink I could think of. There aren’t any other inks I can think of even close to this color. Click here to see the Pen Saijiki inks together, and here to see the green inks together. I used a broad Kaweco Sport Lagoon Blue on an ivory Hippo Noto Notebook. The ink had an average flow. The downside to this ink is that it’s so light that it picks up every single molecule of ink left in your pen from the last color you used. I knew this ink was light so I washed the pen out and put it through an ultrasonic cleaner twice just to make sure it was squeaky clean before I filled it with this light ink. I’m very intentional about cleaning my pens, but I did an extra cleaning on it just to be safe. Even after all of that, the pen still picked up a bit of old ink in the middle of the paragraph, you can see the color changes about 1/3 of the way down the page. I think the color is just too light for me to use. Overall, I love the color of this ink, it’s just too light for me. I’m glad I only got a sample since I can’t see myself ever using this ink again. 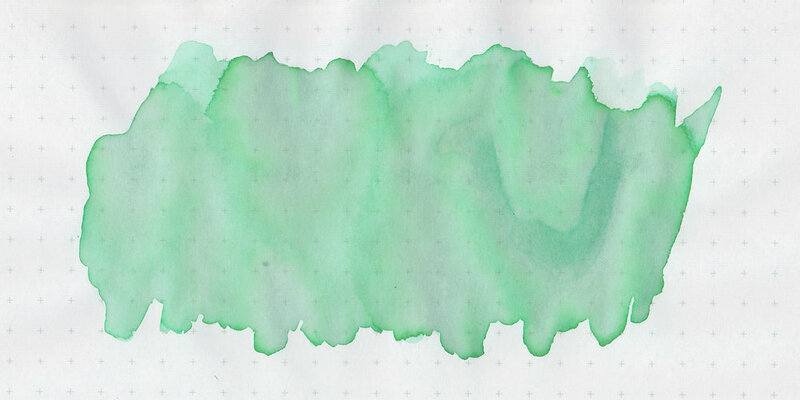 I really want someone to make a darker version of this mint green color, like Diamine Soft Mint with more yellow in it. Disclaimer: I purchased this ink myself, and all photos and opinions are my own. This page does not contain affiliate links and is not sponsored in any way.